These lesson plans were designed to accompany the Huichol Web Of Life Creation and Prayer Exhibition at The Bead Museum, Glendale, Arizona. Expected Learning Outcomes for youth or adults who view the Huichol exhibition and complete one of the lessons in this unit. ...a unique, visually stimulating and informative beaded and textile art exhibition that reflects a way of life. 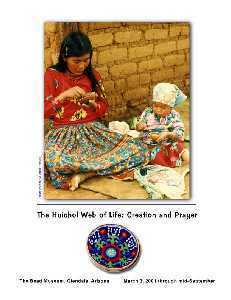 "The Huichol Way", a way of thinking and a way of a centuries old culture surviving in the modern world. ...issues presented in this exhibition assist with public awareness of the politically threatened Huichol people and their struggle for preservation of their cultural heritage though the commercial sale of bead and textile artifacts and current studies concerning their cultural value to all persons. ...creative art making techniques with beads and other materials in creating objects based on the Huichol acts of daily living revealing their stories through a means of symbolic communication. ... the integration of art making and humanities studies as a means of awareness that is relevant and significant to their own lives. 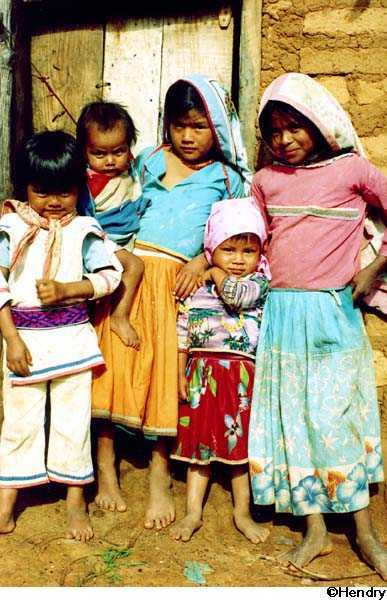 The Huichol people live along the Sierra Madre Occidental mountains in the Mexican states of Jalisco and Nayarit. 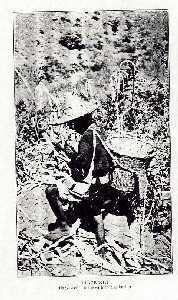 Traditionally, Huicholes live in communities called ranchos, where everyone shares life's responsibilities. These ranchos are structured around ceremonial centers and the growing cycles of crops. 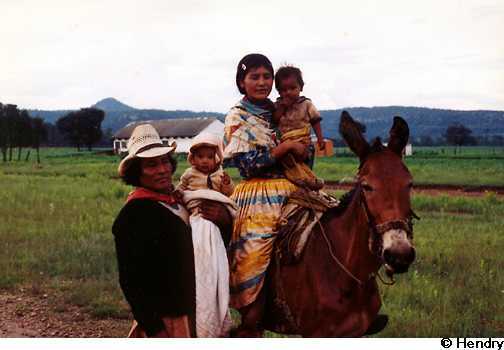 For the Huicholes, life is rich and prosperous when the community is healthy, the harvest is successful, and its people are in harmony. The participation of all members of the society foster this complex, social fabric through communal work, prayer, and ritual which maintains this harmony and balance for generations to come. How different this is from an urban society where materialistic gain can seem to be an obvious indicator of a successful community. 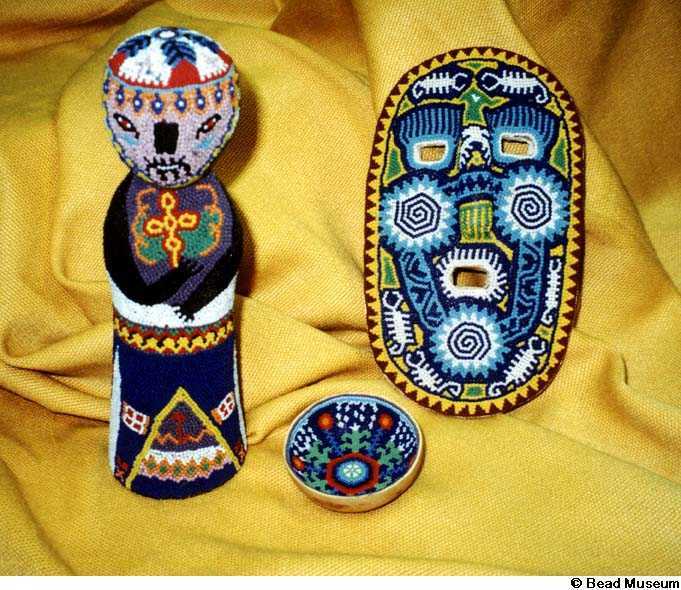 However, even the Huichol are not immune to the impact of other cultures. 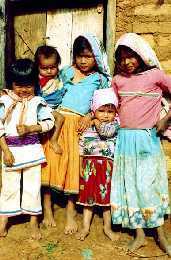 Over the years, many Huicholes have moved to the cities in search of education, economic support, and medical care for their families. These cities include the capitols of Tepic, Guadalajara, and Mexico City. 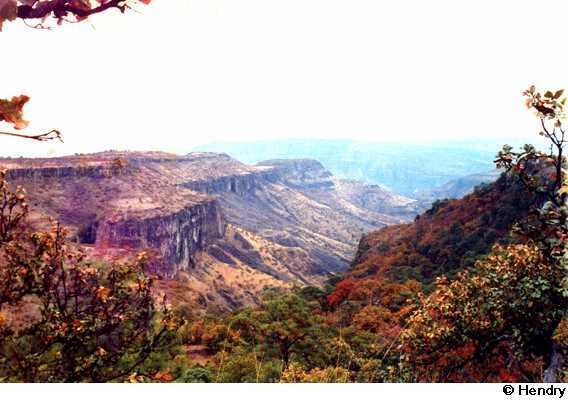 Archaeological discoveries can place the Huichol people in their current environment for the past 1,600 years. This ancient culture is founded on a strict oral tradition and records its history through storytelling and symbols in their art works. 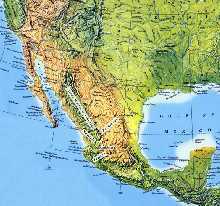 (Although in the past decade textbooks have been written in Huichol to be used by the Huichol children in school.) All their societal knowledge has been passed down from one generation to the other through these stories, rituals, ceremonies and arts learned from the elders of the community. For the Huicholes, art is life and religion. 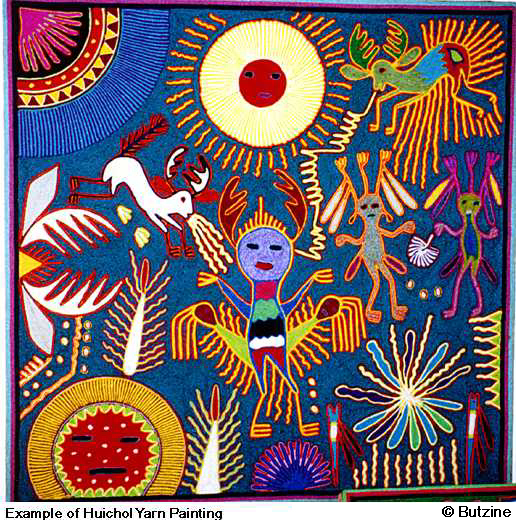 "Through their artwork, the Huichol Indians encode and document their spiritual	knowledge", writes Susana Valadez. Their arts include music, dance, ceremonies, beaded objects including gourd bowls (jicara), embroideries, weavings and yarn paintings called nierikas. 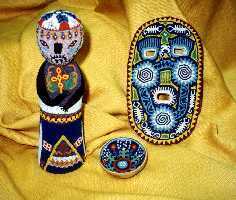 A vast number of Huicholes are artists/shamans. Shamans are special leaders and healers in the ranchos. They help to restore balance within the communities. They begin with healing themselves (this healing is of the complete being: physical, emotional and intellectual), next their immediate circle of family, friends, and neighbors, and ultimately in "healing" the earth by restoring balance. Huichol ceremonies revolve around the planting and harvesting of maize (corn) and special annual pilgrimages to their sacred land of Wirikuta. Only the shaman translate the insights of hallucinogenic visions experienced on a sacred pilgrimage. These visions are meant to communicate messages directly from the supernatural realm. With the encroachment of "modern" society, the Huicholes use their art as a commodity. They also use their history (cosmogony) as inspiration in the preservation of their cultural heritage. Huicholes see themselves as caretakers of the earth and all its living beings. By viewing their art we discover symbols of a multi faceted society that deals with answering questions to universal, shared human concerns: Who am I? Where did I come from? Where will I go when I die? What is my purpose for being on this earth? 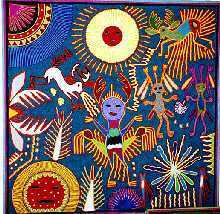 The Huichol have a cosmology much like other agrarian cultures that predated the Spanish conquests, and this cosmology exists in other parts of the world today. Their rituals include remembrance and honoring of their ancestors; commitment and love to their family, friends and neighbors; respect for the land and the incorporation of the life cycle into their daily practices; and the importance of the arts to convey moral lessons that benefit self and the community. By bringing to light such rich cultural traditions, we may learn and compare them to our culture and traditions. If necessary we might adjust practices that may be out of balance personally and place those negative behaviors into harmony within ourselves and our communities. The lesson plans were written by Lisza Jaurigue; artist, philosopher and art educator. The completed unit was reviewed and edited by Dr. Mary Stokrocki, Arizona State University Art Education and Research professor. Funds for this project were provided from grants by the Arizona Commission on the Arts, the Glendale Arts Council, and the Soroptomists of the West Valley. Formatted for the Internet by Paul Hillman. Images of Huichol art to support this curriculum have been made possible through photographing the collections of Kia Chapman and The Bead Museum, Glendale, Arizona, and can only be used for educational purposes. Images of the Huichol people in their homeland have been made available through the photography of Jesse Hendry, Puerto Vallarta, Mexico. These images are copyrighted and can be downloaded for only educational purposes. 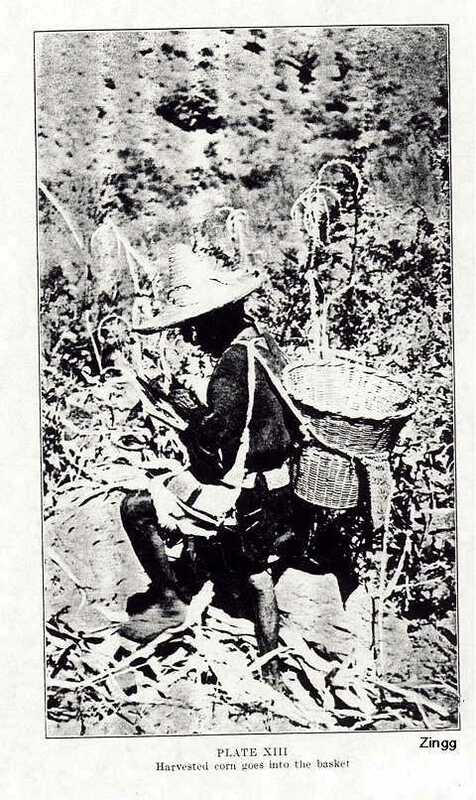 Supplemental information on the Huichol, not secured in reference literature, was provided through interviews with Judith Anderson, Puerto Vallarta, Mexico. Bilingual translation of the statements that accompany the Huichol exhibition are written by Rev. Jorge Rodriguez Eagar, Ph.D. This project has become an international community endeavor, to present concepts of tolerance and appreciation for a culture of people and their art, who live in a manner different than ours. It is also hoped that through the art making activities in this unit, participants continue to develop their artistic skills and techniques.